The seven extant species of the Nyctibiidae occur in forests of tropical Central America and South America. Osteologically, these birds are well characterized by a derived skull morphology with a very short beak and strongly bowed jugal bars (Fig. 12.2), and by a grotesquely abbreviated tarsometatarsus. 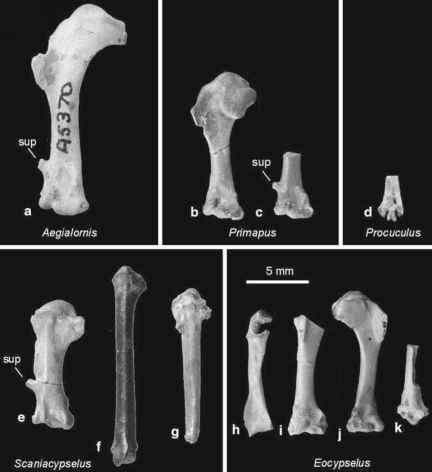 Their first fossil record was a proximal humerus from an unknown horizon of the Quercy fissure fillings, which was described as Euronyctibius kurochkini by Mourer-Chauvire (1989). Complete skeletons of stem group Nyctibiidae were subsequently reported from Messel (Mayr 1999b, 2001b, 2005d), where two species, Paraprefica major Mayr, 1999 and P. kelleri Mayr, 1999, have been recognized (Fig. 12.7). As in extant Nyctibiidae, the palatine bones of Paraprefica are greatly enlarged, the tibio-tarsus lacks an ossified supratendinal bridge, the tarsometatarsus is greatly abbreviated, and the tail feathers are fairly long. The carpometacarpus is, however, proportionally longer and more slender than that of extant potoos. Paraprefica was erroneously assigned to the Preficinae in the original description (Mayr 1999b), but the similarities to the latter are now considered to be plesiomorphic for the clade including "caprimulgiform" and apodiform birds (Mayr 2005d). Although there seem to be minor differences in the shape of the humerus (Mayr 2005d), detailed comparisons between Paraprefica and Euronyctibius are limited by the incomplete fossil record of the latter.